My life, under the microscope...: how 'bout a giveaway? I am secretly a "horse person" that has not fully reached my potential, haha. Some day though, some day! Oooh! Pick me! Pick me! I think he's a cutie, and I need some of your art! I love watching how your art progresses over time. I admire your talent, and I love your dedication to your work. It inspires me to try harder with my artwork. I would love to have a piece of your work to enjoy and display. Plus, baby horses are just so cute! The first and most important reason for wanting some of your work is my admiration for your art. Simply, it;s beautiful and satisfying. Best luck with the stubborn mammoth ivory. Ah....the reason you should pick me or should I say my daughter Ashleigh is because it is her birthday today...she is a deprived horse kid ( Dad does not think we have time for a horse ) who is also a budding artist and photographer. Also a pretty good little farm girl who can pull a goat kid if need be.. and can handle the occasional ugly rooster. And last she so delights in giving random acts of kindness and in other people showing kindness... that should help a tad with your disappointment in the world. I want to win your art because someday it will be worth millions! Plus, it is pretty gorgeous. OK, I'm in. 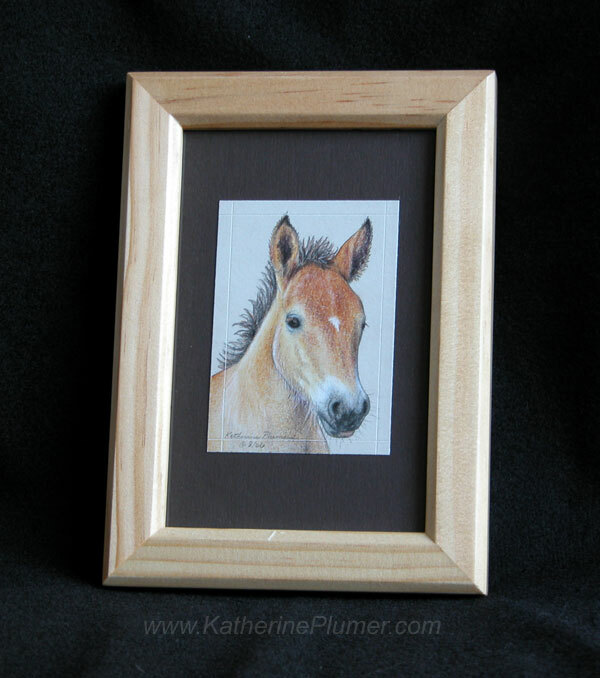 Hawaii needs more little horses, and as a previous commenter noted, this piece is surprisingly affordable. I want to win because that foal's expression is just what I need to cheer me up now that I found they are moving me from Aquarius to Capricorn! (and I am certain I heard him say"Aaron...wiiiiinn me!" Ooh, I'd like to win because Addie is a total animal lover. That would make her year! I'll comment, just so you know I'm reading! "I've been frustrated and annoyed by the world lately, so I'd like to make someone happy." What an inspired statement. It has already made my day happy. Count me in the giveaway. B) You wouldn't have to ship it to me, because you'll see me next week! I'm just a huge fan of your art, and owning an original "Katherine Plumer" would go nicely in my curio along with those original signed prints and cowboy hat I have from Ron Smith, Winston Churchill's autographed book and hand written letters, Lee Griffith's art, Weldon Lister's castings, Tira Mitchell's art, Photo's with President G.W. Bush,Original signed books and prints from Creative Art and much more. Don't you think your print would fit in with these great talents of the engraving world? I do. All of your work makes great gifts and the best ones look good on my wall! My oldest daughter is a horse riding, horse loving fanatic. I would love so much to be able to give this to her for her birthday.